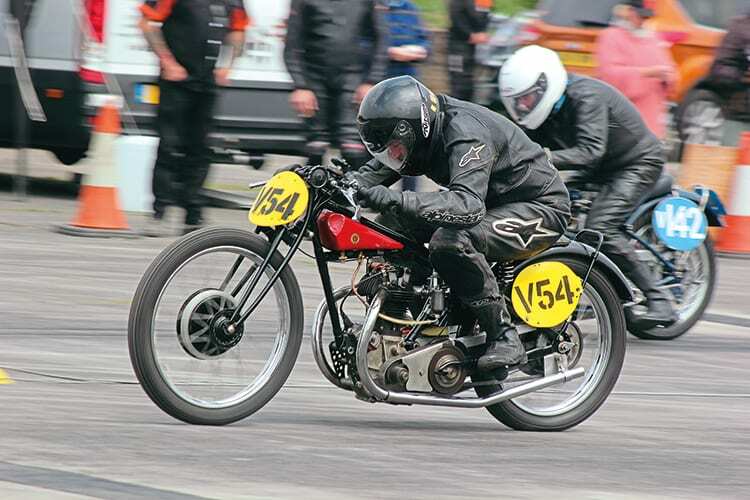 Jonathan Clarke recorded consistent 15sec runs on his 500cc Rudge Special. Westonzoyland is always a popular venue for competitors and spectators at any of the National Sprint Association’s events, held over a straight quarter-mile course at the former Second World War airfield. This, on May 6-7, was the first event on this season’s sprint calendar to take place at the location and attracted a rich mixture of vintage and classic machinery to do battle over the two-day meeting. Among the smaller capacity classes, former grasstrack rider Peter Thomas rode a 250cc Hagon-BSA converted for sprinting. He was also contesting the prewar quarter-litre class on a 1938 Tiger 70. Jonathan Clarke posted 15.41 at 83mph on his 500cc Rudge Special, quickest of the prewar bikes. Day entry Stuart Balnaves got into the 15sec zone on his 1934 KTT, just eclipsing the 16.09/81mph of Dave Kenyon’s prewar Velocette MAC, while John Carter’s postwar version ran a best of 15.08/86mph. Although not troubling the Japanese-mounted front-runners in 750 racing, Simon Rees was having a successful outing on ‘Dangermouse’, his 750cc Triumph-powered machine, a little quicker than Jasper Joy’s ‘Mickey Taker’ a former drag-race Triumph. Unlucky Tim Howell was soon side-lined by problems with his supercharged BSA A65. There was plenty more variety in the smaller Classic class, with Andrew Webb’s 350 Aermacchi heading the field with 15.44/89mph, but less than a tenth of a second in front of Glen Jefferies, who was getting to grips with a recently acquired and unusual Tricati, where a Triumph T100 Daytona had been squeezed into Ducati cycle parts. Tony Lockwood was steadily improving on his Greeves Oulton, a rare 350cc two-stroke single from the Essex manufacturer. Jasper Joy continued to dominate the bigger classic category, his Trident consistently recording times in the 11sec zone to best the challenges of Mike Wheeler (Nourish-Weslake) and John Langridge (Norton Atlas). Further meetings at Westonzoyland are scheduled for June 17-18, August 5-6 and October 7-8.